One of the best things you can have as a dog owner is a retractable leash. It just makes walks so much better for you and your dog. Why? Because it gives you a lot of control without being too restrictive for your dog. We researched some of the best products out there to put together this retractable dog leash buying guide. Before we get started, let’s take a look at some of the key features you need to know about. Length: Most of these leashes are either 16 or 26 feet long. The length you get largely depends on your dog. If you find that you need to exert more control, a shorter leash might be a better option. Tangle Free: Tangle free leashes are all about how they enter the handle and are wound up when you retract them. The last thing you want is the leash to get wrapped up in itself when you’re trying to shorten the leash. Light: Lights are such a great feature and a really bright idea. We found a few with integrated lights that are really easy to use. One of them is even removable so you can use it as a flashlight. Dog Weight: There are a few items on our list that are for smaller dogs but most of them are for dogs up to 110 pounds. That’s a lot, it even covers some of the giant breeds. 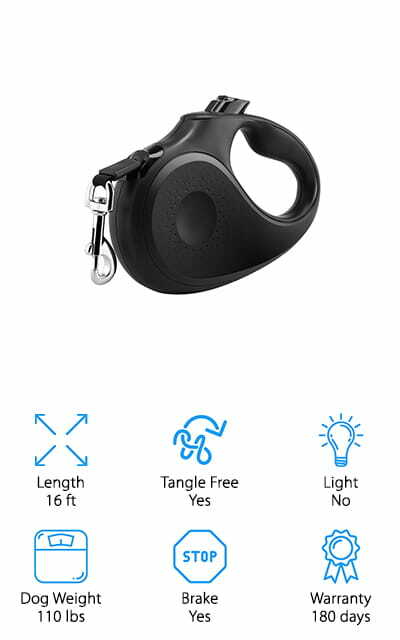 Brake: A brake lets you stop your dog from uncoiling the whole leash at once and lets you decide when enough is enough. It’s part of what makes these leashes so good and really helps keep your dog safe. Warranty: There’s no such thing as a chew proof retractable dog leash because the right dog will be able to destroy anything. That said, most of these products come with pretty great warranties that cover just about everything else. Now that you know a little more about what to look for in a retractable leash, let’s get into our reviews. Here’s how it works. We put our top and budget picks first. That way you’ll get to them even if you’re in hurry and can’t read through to the end. But stick around if you can, every one of these leashes is a great option for you and your pup. Ready to get started? Let’s go! The Flexi Classic Cord Leash is our top pick because it’s such a durable retractable dog leash. The handles are ergonomically designed and easy to use. Plus, there’s a one-handed braking system that stops your dog from continuing to pull on the leash. It even has a permanent stop function that keeps your dog right next to you when necessary. The leash itself is made of flexicord that unrolls and retracts smoothly no matter how you hold the handle. After your walk, the leash retracts all the way inside the handle to the chromed snap hook. And speaking of the handle, it’s available in 4 different colors: blue, back, pink, and red. 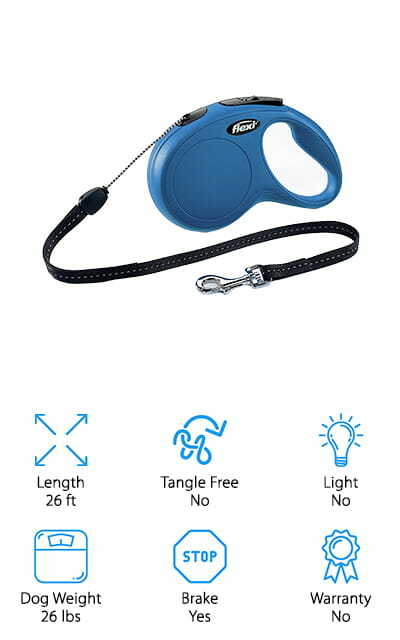 One more thing, this leash can also be upgraded with additional accessories including a multi-box and LED lighting system. 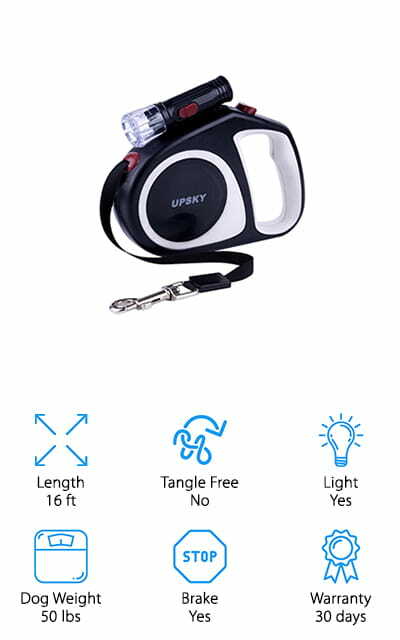 For the best cheap retractable leash and best retractable dog leash with light, check out our budget pick from UPSKY. It’s suitable for medium and small dogs up to 50 pounds. One of the best things about this leash is the included flashlight, which makes it perfect for nighttime dog walks. It’s detachable and even comes with the battery included. To keep complete control over your pet, this leash has a one button brake and lock system. 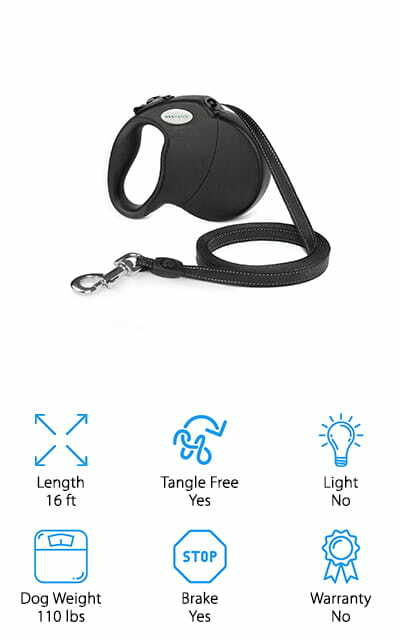 Easily adjust the length to keep your pup right where you need him. The material is not only strong enough to hold back dogs who are pulling and running, it’s comfortable to use. The plastic housing has a comfortable design and an ergonomic handle so you’ll always be able to keep a strong grip on your pet. 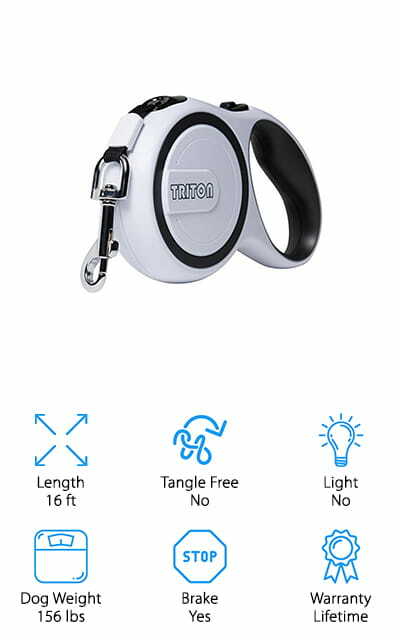 The Triton Retractable Dog Leash is another great option if you’re looking for the best retractable leash for sale. This leash has a really comfortable handle that’s not only covered with an anti-slip rubberized handle, it’s also ergonomically designed so it’s really comfortable. And here’s something awesome: it’s rated up to 156 pounds. While it’s not a non chewable retractable dog leash, it is pretty durable and can handle some abuse. One of the best things about this product is that it comes with a lifetime warranty that covers everything but chewing. As an added bonus, this leash also comes with a collapsible water bowl which comes in hand on long walks on hot days. Clip it right to your dog’s collar and you can stop anywhere along the way. 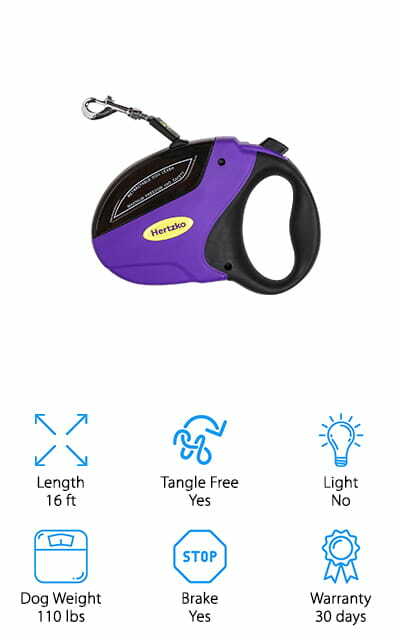 The best retractable dog leash for large dogs is the Hertzko Retractable Dog Leash. It’s actually rated up to 110 pounds so it would work for some giant breeds, too. The comfort-grip and anti-slip handle give you a great grip, too, so you’ll be able to hold on tight and keep your big dog under control. A reliable lock system allows for smooth winding and unwinding. To stop the leash, all you have to do is press the brake button with your thumb. It will stay locked as long as the button is in position. The leash won’t tangle because the handle has a belt feeder that keeps it in position which is so important when you have a bigger breed. One more thing: they offer a 30 day, 100% money-back guarantee. Another great choice for big dogs is the TUG Retractable Dog Leash. The quick lock and unlock feature lets you adjust quickly to your dog’s needs while making sure you can take control when necessary. All you have to do is roll the lock off and on with your thumb. The tangle free cord has 360 degree movement to let your pet run around less restricted. To help keep you comfortable on long walks, the handle is both ergonomically designed and covered with a comfortable, anti-slip handle. That’s not all, the handle has a heavy duty Japanese stainless steel coil for consistent retraction. The reel is made of nylon plastic with fiberglass and lasts a long time. 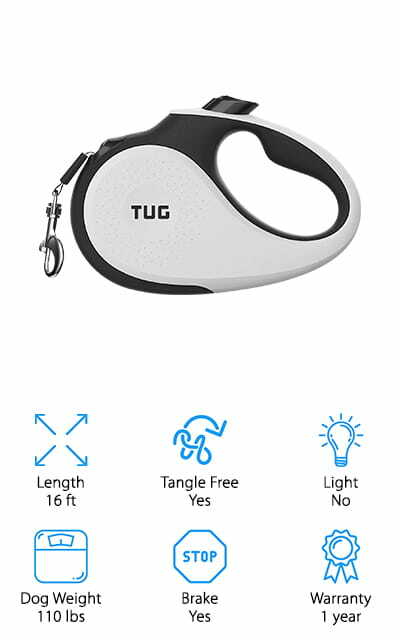 TUG also offers a 1-year warranty so if your retractable leash breaks, they’ll send you a new one. Next up in our retractable dog leash reviews is the TaoTronics Retractable Dog Leash. The easy release and recoiling system is really effective. It’s made of tough material keeps the leash at an ideal length that’s comfortable for both you and your dog. Best of all, you can control it using only one hand. This leash was made for daily use and even works with very large and powerful dogs up to 110 pounds. The ergonomically designed handle has a comfortable non-slip grip that allows you to get a really good grip on your dog. And get this, it even comes with a free roll of plastic bags and a bone-shaped holder. Clip it to your dog’s collar or leash and you’ll be ready to clean up messes on to go. The URPOWER Retractable Dog Leash is another good pick for large breeds. It has a strong, reliable nylon tape that’s rated for dogs up to 110 pounds. The updated springs and anti-tangle rope mouth allow for smooth and complete recoiling from any angle. Something really nice about this leash is that it gives you a pause function on the lock. That means you don’t have to lock it completely if you want your pet to stop tugging. All you have to do is press down on the button to stop the tape from uncoiling and let go when you’re ready to let your dog have some more space. The case is non-toxic and odorless plus it has an anti-slip handle that’s easy to grip and comfortable to hold onto during long walks. This Flexi retractable dog leash is up next in our reviews. It’s ideal for large dogs and can even handle some of the giant breeds since it’s rated up to 110 pounds. The handle has an ergonomic grip with an easy to use braking system. Just slide the button forward and backward to lock and unlock as needed depending on how safe the area is for you and your dog. One of the cool things about this handle is it’s adjustable. Extend the built in system to make the handle a little easier to use for small hands. The handle looks really great, too. It’s available in 4 different colors, each with stylish black accents that really add to the design. You can even upgrade this leash by adding an LED lighting system or the Multi-Box. Another option that’s great for large dogs is the WENFENG Dog Leash. It can handle up to 110 pounds and has a durable, heavy duty internal spring that can stand up to even energetic dogs. The handle has an ergonomic grip with an anti-slip handle that’s the perfect way to hold on to even big dogs who are pulling against you. You can easily adjust the length of the leash using the brake and lock safety system. With just the push of a button, you can lock the leash. Click it again and you’ll start to reel it back in. 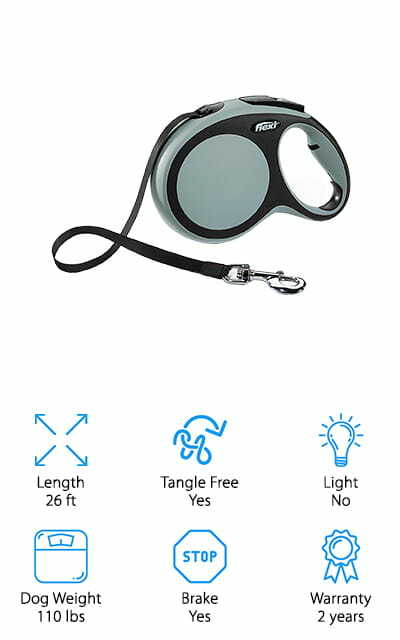 Something really cool about this leash is that it has integrated reflectors so you’re a little bit safer and visible when walking your dog at night. It’s also strong and durable enough to withstand the pulling of larger breeds. 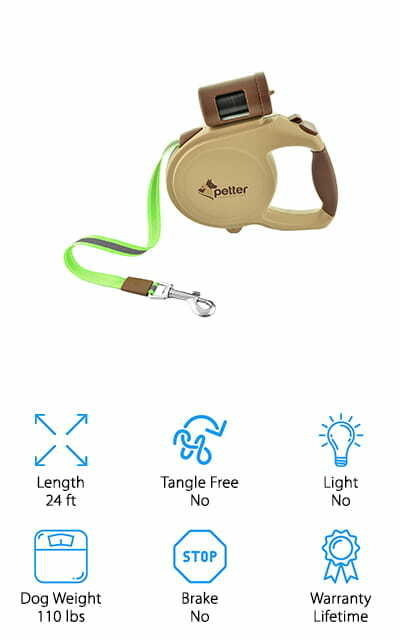 Last but not least on our list is the Petter Dog Leash. There’s really a lot to love about this best retractable leash for large dogs. Of course, it’s retractable, and it works with a very easy to use button. Just click to lock and unlock. The thing that makes this leash stand out is that it’s made of glow-in-the-dark material. 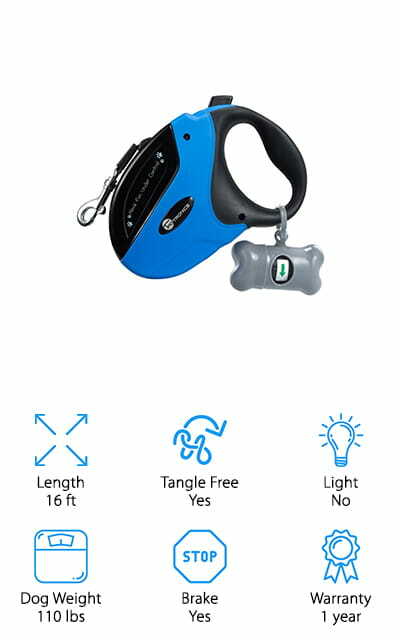 There’s no better way to make sure that you and your dog are seen when walking at night than with this leash. It’s also packed with a lot of really thoughtful features. On the top is a dispenser for poop-bags so you’ll always have one with you when you need it. There’s even a small hook on the bottom where you can attach a favorite toy or bag of treats. And get this: it’s covered by a lifetime warranty.